Patagonia’s R1 Hoody is one of the most popular and iconic technical mid layers on the market right now, and it has been for many years. 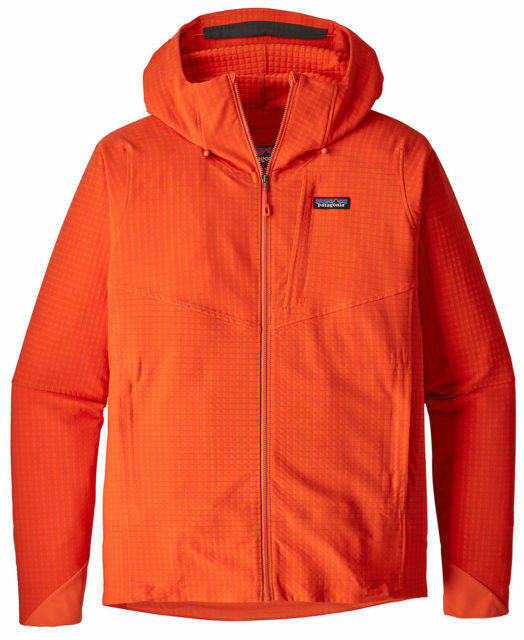 And this spring, Patagonia released a brand-new version of the R1 — the R1 TechFace Hoody (the standard R1 Hoody is still in the line). The new R1 TechFace Hoody is billed as a more versatile version of their iconic R1 Hoody due to a fabric with a “harder” face (a denser, tighter weave on the outside of the fabric). This fabric is designed to offer better abrasion and weather resistance, and that immediately caught my attention. If I have any qualms with the standard R1, they’d be its lack of wind resistance and its tendency to snag on branches, rocks, etc. Initially, I thought the R1 TechFace Hoody would simply replace the standard R1. Well, after around 10 days, it has done that, but much more. The R1 TechFace Hoody is quickly becoming my absolute favorite piece of apparel in my (rather extensive) closet. While Patagonia says the R1 TechFace Hoody has a “slim” fit, I’d say it fits pretty loose, especially for a mid layer. Its fit is not similar to the very slim and athletic cut of the regular R1 Hoody. At first, this really turned me off, but the more I use R1 TechFace Hoody, the more the fit makes sense. The R1 TechFace Hoody shouldn’t be thought of exclusively as a mid layer — it really is more similar to a soft shell outer layer. The loose fit, feature set, and fabric all make the R1 TechFace Hoody feel much more like a shell than a fleece. The fit of the R1 TechFace Hoody is pretty much the same as a trim alpine hard shell like the Rab Sharp Edge, and is even a bit roomier than the Patagonia Knifeblade. The R1 TechFace Hoody is perhaps a touch slimmer than the Sharp Edge in the arms and torso, but not by much, and is slightly longer in the torso. The R1 TechFace Hoody is cut so that you can layer underneath it — I can fit the Patagonia Nano-Air Light Hoody or Micro Puff Hoody under the R1 TechFace Hoody with plenty of room to move around. 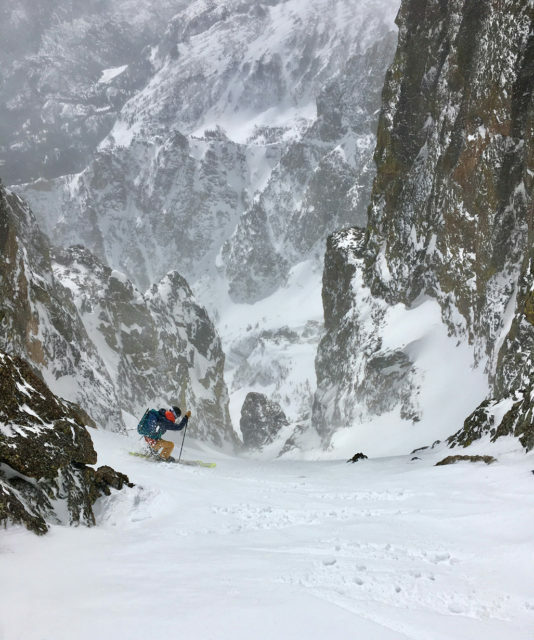 Sam Shaheen in the Patagonia R1 TechFace Hoody, Berthoud Pass, CO. The R1 TechFace Hoody can also be layered under another shell or insulator fairly easily. While its fit accommodates layering underneath, it still isn’t very bulky, so it layers under outer layers much better than hard shells with roomier fits. Plus, the R1 TechFace Hoody’s fabric is pretty slippery so it slides easily under other layers. The R1 TechFace Hoody’s sleeves are also cut a bit longer than most mid layers, and they do a good job of accommodating gloves and high reaches while climbing. The defining characteristic of the R1 TechFace Hoody is definitely the fabric. 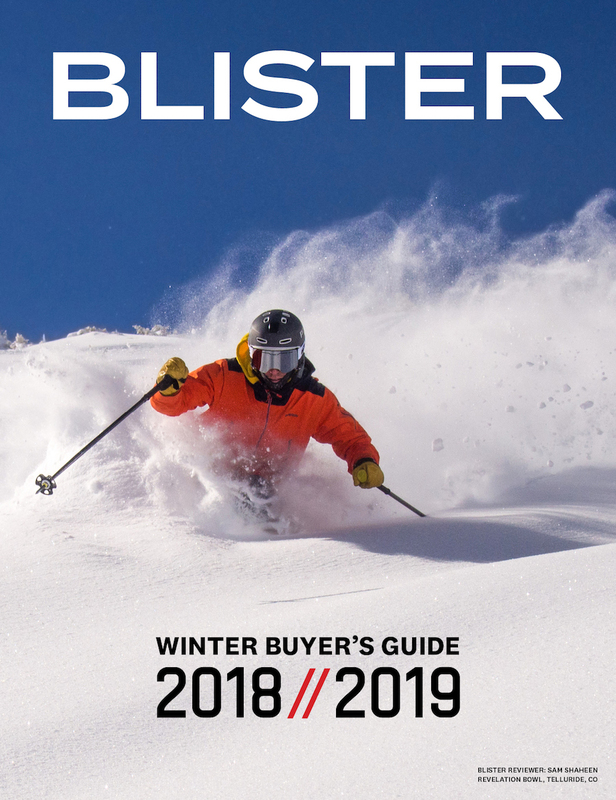 It strikes what I personally believe to be the perfect balance of heat retention, weather resistance, and abrasion resistance for high-output activities like ski touring and ski mountaineering. Granted, “perfect” in this case is pretty subjective. 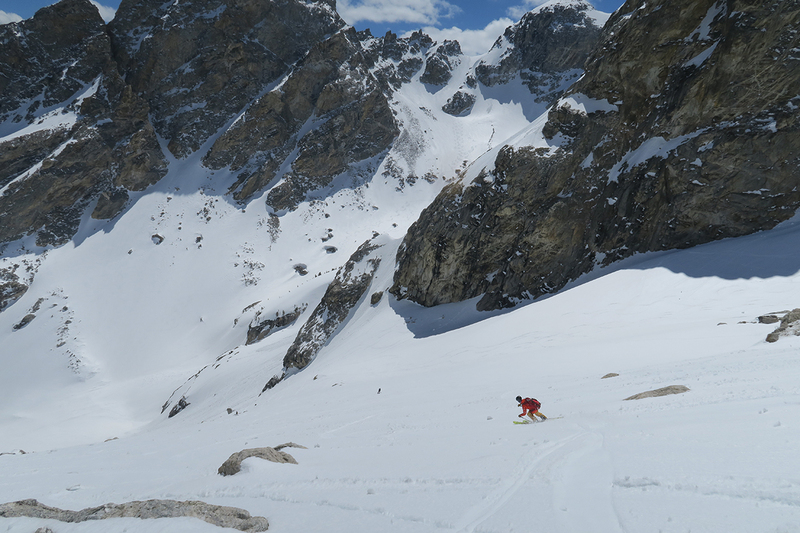 For me, the R1 TechFace Hoody fabric is just about ideal for an outer layer to use all day while ski mountaineering / ski touring in a drier climate like Colorado. 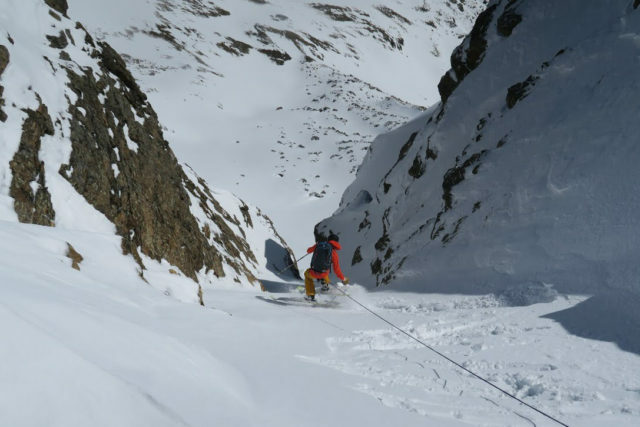 I will typically start off a ski mountaineering day (often in the dark) wearing a lightweight, long sleeve base layer and the R1 TechFace Hoody. On the way up, I’ll sometimes get warm enough to take the R1 TechFace Hoody all the way off. But I’ll usually just leave the front unzipped, and that’s often all I need for temperature regulation. The R1 TechFace Hoody breathes excellently given it’s weather resistance (more on that later). On the down (at least during fairly warm days in the spring), I’ll use the same layering scheme (R1 TechFace Hoody + light base layer), but throw on a puffy over the R1 TechFace Hoody for the transitions. Sometimes, if it is cold, I’ll leave a puffy on for the down until it gets too hot (usually the Rab Zero G, or Patagonia Micro Puff Hoody). When the wind picks up, the R1 TechFace Hoody blocks a surprisingly significant amount of wind. I would say that in moderate winds around 20 mph, the R1 TechFace Hoody blocks about 70-80% of the wind (for comparison, I’d say the regular R1 blocks maybe 30% of similar winds). That’s seriously impressive. In higher winds, the R1 TechFace Hoody can get overpowered and feel a bit too breezy (for winds in roughly the 30-40 mph range). But usually if it is that windy, I’m getting cold anyway so I tend to throw on a puffy insulator over the R1 TechFace Hoody and wear that until I get out of the wind. Because of the combination of minimal loft, good breathability, and great wind resistance, I haven’t once used a hard shell since I’ve started using the R1 TechFace Hoody (I’ve been using it since mid-March). For spring in Colorado, I rarely need any more weather resistance than the R1 TechFace Hoody offers. Granted, I haven’t had any bad weather days with really heavy snow / rain (I’m sure I would still use a hard shell in those scenarios). But overall, the R1 TechFace Hoody has been everything I need as an outer layer in decent weather — it has pretty much all of the weather protection I need while being significantly more breathable than most other shells. The feature set on the R1 TechFace Hoody is very similar to many stretch-woven soft shells on the market now. It has two large zippered hand warming pockets, one zippered chest pocket, a two-way adjustable hood with a laminated brim, an adjustable hem, and stretch cuffs. The pockets are pretty standard for a shell. The handwarmer pockets are pretty big and I don’t personally find myself using them much. It’s worth noting that they do get obscured if I’m wearing a harness / hipbelt. And while the handwarmer pockets are lined with mesh, I’ve found them to be a bit too low to really work as effective vents (which isn’t a huge deal since the fabric is already very breathable). The chest pocket is a nice size and easily fits a large phone or some snacks. The R1 TechFace Hoody’s hood is big enough to fit over a climbing helmet or a ski helmet like the Scott Couloir 2 or Pret Cynic X. The hood adjusts quickly and securely with a drawcord on the back and two drawcords on either side of the front of the hood. I can easily tighten it down so that it works well on my bare head, then loosen it up to fit over my helmet if it is super windy on the ski down. The hem adjust is pretty standard with the drawcords routed into the main pockets. Nothing super special there, just an important feature to have to help keep out wind and snow. The think the cuffs on the R1 TechFace Hoody are amazing. Patagonia uses fairly similar cuffs on many of their mid layers and soft shells (like the Nano-Air series and the old Levitation Hoody), and for good reason — they are pretty dialed. The cuffs have just the right amount of stretch so that I can hike them up on my forearms to keep them out of the way while still being tight enough to do a pretty good job of sealing out drafts. They are super low profile so they easily fit under gloves, and they are extremely soft and comfortable against the skin. Dialed. It’s worth noting though that the cuffs aren’t adjustable, so you can’t crank them down over your gloves like you would on a shell with velcro cuffs. At a measured weight of 416 grams for a Medium, the R1 TechFace Hoody is fairly light, but certainly not the lightest mid layer or shell on the market. 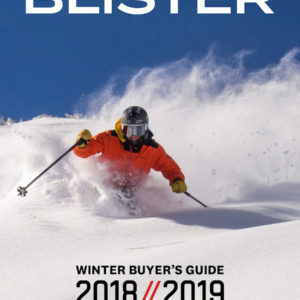 But that is true of most soft shells — you gain a bit of versatility at the cost of weight (as is the case with a lot of gear). For reference, below are some of our measured weights (in grams) for a few notable pieces. Since the R1 TechFace Hoody fits into both the mid layer and soft shell categories, we’ve included some pieces from both categories. So, it’s important to keep in mind the different intended purposes and materials when comparing the weights. As I noted earlier, the R1 TechFace Hoody is surprisingly weather-resistant. When it comes to wind resistance, I would place it well above the Nano-Air Light Hoody and Summit L2 FuseForm ½ Zip Hoodie, and just a hair below the Levitation Hoody. I’d say the R1 TechFace Hoody definitely fits into the soft shell category for weather resistance, though on the less water-resistant end of the spectrum. It won’t shed water and wind nearly as well as a soft shell with a membrane like the Patagonia Knifeblade (RIP), but for days without much precipitation in the forecast (AKA, most days in Colorado), the R1 TechFace Hoody is all I need. I’ve even had it out in light snow with some brief spurts of heavier snow squalls. In the heavy snow, the R1 TechFace Hoody will definitely wet out, but in light or intermittent snow, the R1 sheds snow adequately. And just to be clear, while I’ve found the R1 TechFace to work extremely well for the relatively dry weather in Colorado, it would not be as good of an option for an outer layer in wetter climates like the U.S. Pacific Northwest. While the R1 TechFace Hoody outperforms any fleece I’ve used when it comes to weather resistance, that comes with a slight tradeoff in terms of breathability. The R1 TechFace Hoody certainly breathes better than many mid layers and soft shells (like the Patagonia Nano-Air Light & Levitation, Outdoor Research Ascendant, Marmot Alpha Pro, and Mammut Eisfeld Light SO), but it doesn’t breathe quite as well as its light, thin fabric might suggest. I would say the R1 TechFace Hoody breathes similarly to the (much thicker and slightly warmer) North Face Summit FuseForm L2 or the North Face Dolomiti, but not quite as well as the standard R1 Hoody (which is very breathable). When I first got the R1 TechFace Hoody, I thought it was way too thin and wouldn’t be nearly warm enough. And in non-windy conditions (or when layered under a shell), the R1 TechFace Hoody is definitely not as warm as the standard R1 Hoody. But because it blocks so much wind, the R1 TechFace Hoody is a bit warmer than its light fabric might suggest. While the R1 TechFace Hoody’s fabric isn’t very lofty, its wind resistance means that it will keep you significantly warmer than a non-hard-face fleece when the wind picks up (as opposed to an open-knit fleece like the Rab Alpha Flash, which blocks essentially zero wind). Sam Shaheen in the Patagonia R1 TechFace Hoody, Shooting Star Couloir, CO. I would say that the R1 TechFace Hoody isn’t quite as warm as the North Face Dolomiti or Summit L2 FuseForm ½ Hoodie (the L2 being a bit warmer than the Dolomiti), but the R1 TechFace Hoody is a bit warmer than the Levitation Hoody. The R1 TechFace Hoody is also not as warm as any of the active insulation pieces I’ve tested, such as the North Face Ventrix, Patagonia Nano Air Light, and Outdoor Research Ascendant. Though I’ve only worn it for about 10 days, I haven’t seen any signs of wear on the R1 TechFace Hoody. It does have a pretty thin fabric, so I’m curious to see how it holds up to years of hard use. So far, the DWR is still performing very well, but this will be another thing I’ll be keeping a close eye on while I continue to spend time in the R1 TechFace Hoody. I’ll update this review if anything changes, but right now I’m not too worried about the R1 TechFace Hoody’s durability. I suspect the long term durability of the R1 TechFace Hoody will certainly exceed that of softer-face fleeces like the standard R1, but I don’t think it will hold up as well as thicker softshells like the Levitation. Apparel can be a very subjective category. Everyone has their own favorites and personal preferences (for more on our reviewer’s personal apparel choices, check out this article). But for my own layering preferences and what I do in the mountains (e.g., ski touring and mountaineering where I prioritize breathability and weather resistance over warmth), I find the R1 TechFace Hoody to work extremely well. If you are looking for a versatile soft shell that you can leave on all day when the weather is mild — especially if you run a little on the warm side — I haven’t found a piece that I like more than the R1 TechFace Hoody. It has basically replaced my hard shells for all but the wettest days. Or if you’re looking for a light midlayer that can pull double duty as a shell in a pinch, the R1 TechFace Hoody should definitely be in consideration. 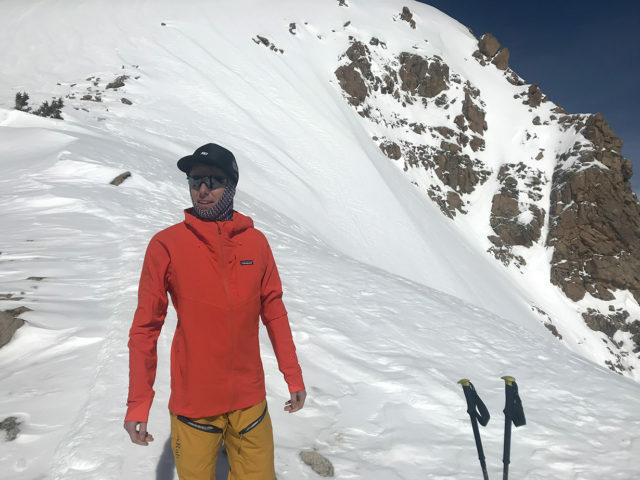 The Patagonia R1 TechFace Hoody has quickly earned the top spot in my rotation of both mid layers and soft shells for spring ski touring and mountaineering. It has a great combination of weather resistance, warmth, and breathability that has let me leave behind my hard shells on mild-weather days. If you’re looking for a very breathable soft shell on the less weather-resistant end of the spectrum, or a mid layer with great weather resistance, then the R1 TechFace Hoody deserves a serious look, or two. Actually, just go try one. I doubt you’ll be disappointed. @Sam – Great review, thanks! What is the neck layer you are wearing in that first pic? 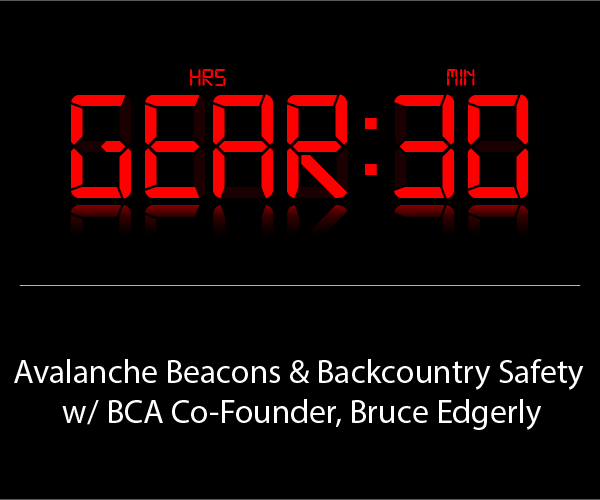 Hey Benjamin, that’s an Outdoor Tech Yowie — my go to daily face protection. I wear one everyday, never leave the house without one! So I have been torn between this and the Dual Aspect Hoodie. Have you tried out the Dual Aspect? If so, what are some of the major draw backs of the Dual Aspect (since it seems you like this one so much)? The major difference I have found is the balaclava hood, but that’s not necessarily a deal breaker. Hey Will, I don’t have any experience with the Dual Aspect Hoodie, sorry! 1) is there a hoodless version of this jacket? 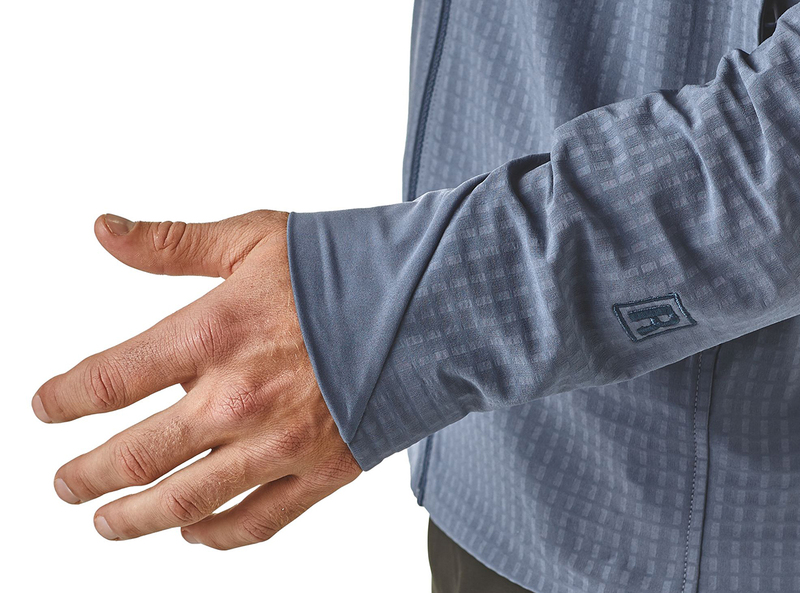 2) how does R1 Techface fabric compare w/ Windpro Hardface? My entire family loves their Windpro HF midlayers when our west coast resort days warm up too much for hardshells. 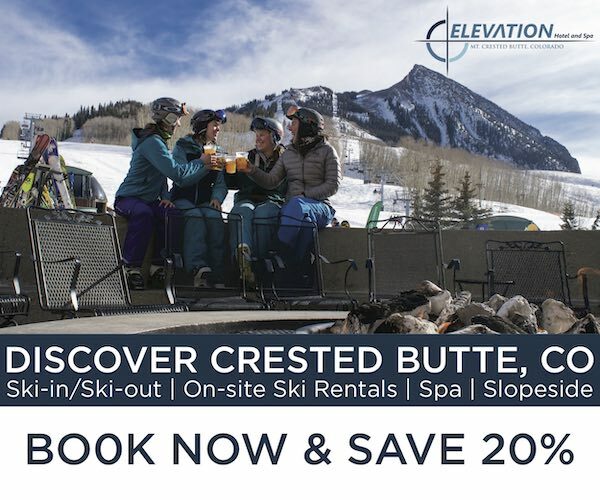 They are the best compromise I’ve found between wind & abrasion resistance w/ excellent breathability, solid DWR & “goldilocks” warmth for our “never as cold as Colorado” climate. 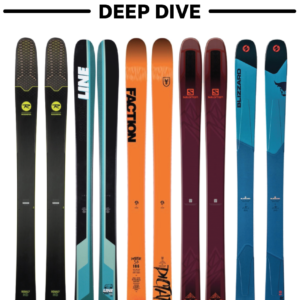 Problem is, it has become hard to find (discontinued or rebranded by Polartec?) and my much loved Cloudveil jacket is on its last legs. If this R1 only comes hooded, are there other strong contenders? I don’t have any experience with Windpro HF, but right now the TechFace R1 only comes with a hood. There are so many softshell varieties out there that finding the one that works for you can be tough. The best thing you can do is to keep looking and trying stuff until one really clicks with you. Wish I could be more help! Thanks Sam. 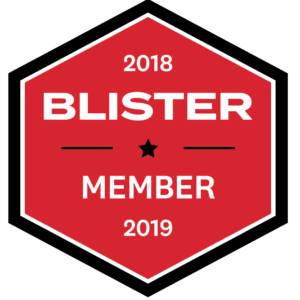 I’ve been super fascinated by Blister’s ongoing coverage of the new “active insulation” tech, but out here in the balmy Sierra Nevadas, one of my puffies lives full time at the bottom of my touring pack, & the other only gets worn for Après when I’m no longer sweating, so I’m in the market for something breathable but a lot lighter insulation-wise & w/ a tougher face fabric than you average puffy or midlayer. Looks like my local REI has the R1 TF, so I guess I can at least check out the fit & feel of the fabric. Any upcoming reviews on pants for spring touring??? Looking for suggestions for minimally featured breathable pants that are trim enough for mountaineering but not euro geek status. Just rereading this. Am I correct that you are saying that the R1HF is both more wind resistant AND more breathable than thee Nano-Air Light? I also wish they would make the back out of plain R1, or similar. The difference between front and back is What I like about my Nano-air Light Hybrid. Hey Tjaard, yes. The R1 TechFace Hoody is both more wind resistant and more breathable than the Nano-Air Light (but the Nano Air is much warmer). Just to clarify, you wrote: “..than the Nano-Air Light (but the Nano-Air is much warmer)”. In that last part, did you mean the Nano-Air light, or the regular Nano-Air? Hey Tjaard, I meant the Nano-Air Light, but both will be significantly warmer than the R1 TechFace(the Nano Air is noticeably warmer than the Nano-Air Light).